Nebraska’s electricity providers include public power districts, municipal utilities, and electric cooperatives. Our state has 166 publicly owned utilities governed by community-elected boards. Visit the website of the Nebraska Power Association for a list of all of them. 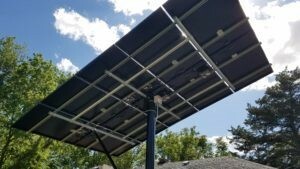 The National Rural Electric Cooperative Association’s innovative SUNDA Project helps rural electric cooperatives nationwide to accelerate utility solar. The SUNDA team, with the help of the pilot project’s participating 17 rural electric cooperatives, utilized lessons learned from their deployment of 30 megawatts of photovoltaic (PV) solar to develop tools and resources that help other cooperatives to deploy solar in their own communities. Green Power Network: Can I Buy Green Power In My State?